"I was cycling along the river and saw a creature in the water beneath an overhanging gum tree making a BIG commotion - it was so large and vigorous I thought it was a fledgling bird drowning! 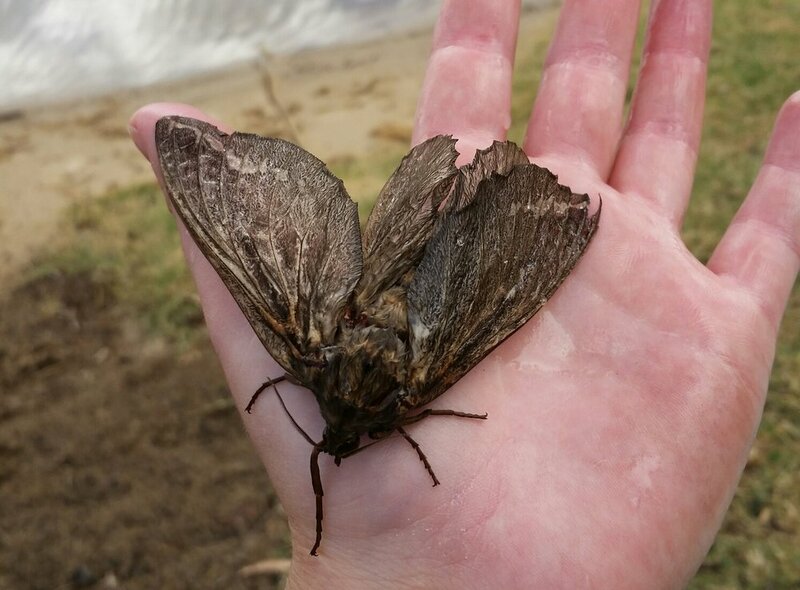 I went down and fished it out of the water to instead find this very large moth! Image: Family Hepialidae, by QuestaGamer Caesarion, CC BY-NC. It was quite waterlogged and damaged with most of its colour and ID markings gone. Looks like it would have been a grey brown colour, possibly with a bit of lighter colour along the wing margin? Antennae were not particularly feathery and the legs were not hairy. Its abdomen was as long and thick as my ring finger, and it certainly had some weight to it. Moths are far from my forte! My best guess is something from the Cossidae family, possibly a goat moth or witchety grub moth? I left this one to dry out in a tree, but between the ants and opportunistic birds it may well be powering the circle of life by now." Well done on your rescue Caesarion! Hopefully the moth lived another day due to your efforts... or at least made a nice meal for something else :P For those wondering, our experts identified it as a Swift moth (family Hepialidae). Check out this gallery of other QuestaGame Hepialidae sightings on the Atlas of Living Australia. Based on the antennae, we're pretty certain this particular one is an Abantiades species. Also, looks like it may have have just emerged from its cocoon given the condition of its wings.